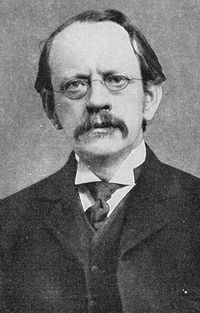 Thomson is the faither o Nobel laureate George Paget Thomson. Sir Joseph John Thomson OM PRS (18 December 1856 – 30 August 1940) wis an Inglis pheesicist. He wis electit as a fellae o the Ryal Society o Lunnon an appyntit tae the Cavendish Professorship o Experimental Pheesics at the Cambridge Varsity's Cavendish Laboratory in 1884.